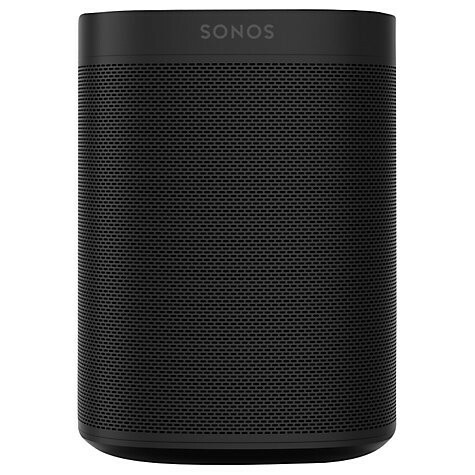 Product information "Sonos ONE Voice Controlled Speaker in Black"
Play and control your music hands-free. Just ask. Sonos One blends great sound with Amazon Alexa, the easy-to-use voice service, for hands-free control of your music and more. Use your voice to play songs while you cook. Tell Alexa to turn up the volume while you're in the shower. Or even request a lullaby when you’re tucking the kids into bed. Sonos One connects with the Amazon Alexa voice service easily over Wi-Fi. Just set up the speaker, select the Sonos skill in the Amazon Alexa app (available on Fire OS, Android and iOS), and you’re all set to play music, get news and answers, manage your smart devices, and enjoy everything else Alexa does use nothing but your Sonos One. Sonos One allows you to start and control your music with your voice with Amazon Alexa built in. Use your voice and the Sonos app* (Android and iOS) to control and manage all your music in one place: Amazon Music, Spotify**, Apple Music, TuneIn Radio, podcasts and much more. Play songs, check news and traffic, manage smart devices and enjoy a range of other helpful Amazon Alexa skills using a single Sonos speaker. Enjoy surprisingly rich, room-filling sound from a smart speaker, with the superb audio quality that Sonos is renowned for. Add your existing music streaming service or discover something new. Whether curated or on-demand, free or subscription-based, Sonos has you covered with access to a growing list of over 30 music services. For example, you can enjoy Apple Music, Spotify**, Deezer, Tidal, Google Play Music or many more paid services or Soundcloud, TuneIn Radio or 22Tracks free services. Related links to "Sonos ONE Voice Controlled Speaker in Black"
Customer review for "Sonos ONE Voice Controlled Speaker in Black"